Not to be confused with Maariv or Maarif (disambiguation). "Mareb" redirects here. For the river in Ethiopia, see Mareb River. "Mariba" redirects here. For the small town in the United States, see Mariba, Kentucky. Marib (Arabic: مَأْرِب‎, translit. Maʾrib) is the capital city of Ma'rib Governorate, Yemen. It was the capital of the ancient kingdom of Sabaʾ (Arabic: سَبَأ‎), which some scholars believe to be the ancient Sheba of biblical fame. It is located approximately 120 kilometres (75 miles) east of Yemen's modern capital, Sana'a, and is in the region of the Sarawat Mountains. It has a current population of 16,794. 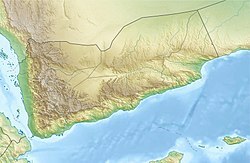 In 2011, Ma'rib has been referred to as "the Al Qaeda capital of Yemen". The Sabaean kingdom was based around Ma'rib, with territory in northern Yemen. The Sabaean kings made their capital at Ma'rib, and built great irrigation works such as the Ma'rib Dam, whose ruins are still visible. The Marib Dam supported a flourishing culture for more than a thousand years; its collapse in 575 CE, before the birth of Muhammad, may be one of the main reasons that Arabia did not become Christian. [clarification needed] They also built castles and temples in the area, notably Awwam and Barran, respectively. Saba was known for dealing in the lucrative frankincense and myrrh trade. They were a seafaring people and were known to have influence and a population in the Northeast African kingdom of Dʿmt, across the Red Sea in Eritrea and Abyssinia, the only other source of both frankincense and myrrh. In 25 BC, Aelius Gallus of Rome led an expedition to Ma'rib, laying siege to the city. He suffered major losses and was forced to retreat to Egypt. The site of ancient Ma'rib was largely abandoned during the 20th century. Although a small village remains, the multi-story mud-brick buildings of the historic city are largely in ruins. The modern city of Ma'rib is located about 3.5 kilometres (2.2 miles) north of the center of the ancient city. In 1982, floods ravaged the country. In response, Sheikh Zayed bin Sultan Al Nahyan of the United Arab Emirates financed the construction of the current dam of Ma'rib in 1984. The Shaikh himself was reportedly descended from people who migrated from the area of Ma'rib to what is now the UAE. During the Yemeni Civil War (2015–present), Ma'rib and the surrounding Ma'rib Governorate came under attack by the Houthis, a Zaidi Shia movement rebelling against the government of Abdrabbuh Mansour Hadi. The tribes of Ma'rib repelled the Houthis with help from the Saudi Arabian-led intervention in Yemen. According to the Abu Dhabi-based The National newspaper, "With 80 per cent of the province's population Sunni and only one of the five main tribes supportive of the Zaidi Shiite Houthis, tribal fighters managed to repel the attack. As a result, the Houthis control only about 20 per cent of Marib and the oil fields remained under Hadi's control. Many of the tribes in Marib, and in neighbouring Al Jawf and Shabwa provinces, are loyal to Saudi Arabia, which has offered financial support over many years. According to two tribal chiefs there are 8,000 Yemeni forces and tribal fighters based in Marib united against the Houthis. Some are directly loyal to President Hadi, others to Saudi Arabia and a large number to the Islah Party, a religiously conservative political group. The entire First Armoured Brigade, considered a military wing of Islah, based in Sanaa, was transferred to Marib in 2014 to defend the province. Other sections of Yemen's military remained loyal to Ali Abdullah Saleh, the former president overthrown by Arab Spring protests who has now sided with the Houthis against Hadi. After the Saudi-led coalition joined the war in March 2015 and drove the Houthis from most of Yemen's southern provinces in July 2015, focus shifted to Marib, known s the gateway to Sana'a, where the strong support base made it a natural location for an attack in the north. The city of Marib is just 173 kilometres (107 miles) from the capital, and the province adjoins the predominantly Sunni provinces of Al Jawf, Al-Baitha and Shabwa, where the Houthis' control is unlikely to hold if attacked. In particular, Al-Jawf to the north would provide a route towards the Houthi's Saada stronghold. The coalition began moving supplies to Marib in March 2015, using land routes from Saudi Arabia through Hadramout and Shabwa provinces. On August 2015, coalition forces started flying more reinforcements to Marib using a small airport in the tiny town of Safer, 60km east of Marib city. Loyalist military sources said further reinforcements including tanks, armoured vehicles, rocket launchers and Apache helicopters arrived August 2015. The town serves as a base for the state-run Safer Exploration and Production Operations Company and other foreign companies working in Yemen's vital energy sector. The main gas pipeline south also runs through the town, which is controlled by the pro-Hadi military commander Abdullah Al-Shaddadi. The nearest Houthi presence was in Baihan in Shabwa province, 50 kilometres (31 miles) away." Forty-five Emirati troops, along with 10 Saudis and 5 Bahrainis were killed in a Houthi ballistic missile strike on the Safer base near Ma'rib on December 14, 2015. According to Al-Jazeera, by 7 April 2015, Houthi forces had been expelled from the majority of Ma'rib Governorate by Saudi-backed tribesmen. The governor of Marib told Al-Jazeera that forces allied to President Abd-Rabbu Mansour Hadi and the Gulf coalition were "perusing the last pockets of Houthis" in the province. Five foreign mine clearance experts were killed in an explosion inside the Saudi Project for Landmine Clearance MASAM on January 20 2019. One of the experts was a resident of South Africa of British descent. Other members of the team were from Colombia and unspecified countries in Africa. The Yemen Oil Refining Company opened a refinery in Ma'rib in 1986, which produces 10,000 barrels (1,600 m3) of oil per day (2009). In November 2009, the company announced an agreement with Korea's Shinhan to expand and upgrade the refinery to produce 25,000 barrels (4,000 m3)/day. Ma'rib is the start of the Marib-Ra's Isa oil pipeline (438 km (272 mi)), with a capacity of 200,000 barrels (32,000 m3) per day. Ma'rib has a hot desert climate (Köppen climate classification: BWh). ^ a b "Saba / Sa'abia / Sheba". The History Files (http://www.historyfiles.co.uk). Retrieved 2008-06-27. The kingdom of Saba is known to have existed in the region of Yemen. By 1000 BC caravan trains of camels journeyed from Oman in south-east Arabia to the Mediterranean. As the camel drivers passed through the deserts of Yemen, experts believe that many of them would have called in at Ma'rib. Dating from at least 1050 BC, and now barren and dry, Ma'rib was then a lush oasis teeming with palm trees and exotic plants. Ideally placed, it was situated on the trade routes and with a unique dam of vast proportions. It was also one of only two main sources of frankincense (the other being East Africa), so Saba had a virtual monopoly. Ma'rib's wealth accumulated to such an extent that the city became a byword for riches beyond belief throughout the Arab world. Its people, the Sabeans - a group whose name bears the same etymological root as Saba - lived in South Arabia between the tenth and sixth centuries BC. Their main temple - Mahram Bilqis, or temple of the moon god (situated about three miles (5 km) from the capital city of Ma'rib) - was so famous that it remained sacred even after the collapse of the Sabean civilisation in the sixth century BC - caused by the rerouting of the spice trail. By that point the dam, now in a poor state of repair, was finally breached. The irrigation system was lost, the people abandoned the site within a year or so, and the temple fell into disrepair and was eventually covered by sand. Saba was known by the Hebrews as Sheba [Note that the collapse of the dam was actually in 575 C.E., as shown in the timeline in the same article in the History Files, and attested by MacCulloch (2009)]. ^ a b Robert D. Burrowes (2010). Historical Dictionary of Yemen. Rowman & Littlefield. pp. 234–319. ISBN 0810855283. ^ Symmes, P. (2013-04-25). "Anwar al-Awlaki: The Next Bin Laden". GQ. ^ Salama, S. (2015-12-01). "UAE playing a historic role in Yemen". Gulf News. Retrieved 2018-04-09. ^ Al-Qalisi, M.; Vela, J. (2015-09-30). "The dam that Sheikh Zayed built". The National. Retrieved 2018-04-09. ^ WAM (2013-07-29). "Key aid projects during Zayed's time". Khaleej Times. Retrieved 2018-04-09. ^ Naylor, H. (2015-02-14). "Houthi rebels in Yemen eye oil-rich province, sparking fears of all-out civil war". The Washington Post. ^ Almasmari, H. (2015-09-07). "Why Marib province is crucial to coalition victory in Yemen". The National. ^ "Explosion kills 5 mine clearance experts in Yemen". Anadolu Agency. 2019-01-20. Retrieved 2019-01-25. ^ "الشركة اليمنية لتكرير النفط توقع اتفاقا مع شركة شينهان الكورية الجنوبية لتوسعة وتحديث مصفاة مأرب". CNBC عربية. Retrieved 2011-04-05. ^ "Middle East Pipelines map - Crude Oil (petroleum) pipelines - Natural Gas pipelines - Products pipelines". Theodora.com/pipelines. Retrieved 2011-04-06. ^ "Climate: Ma'rib - Climate-Data.org". Retrieved 28 October 2017. Durant, Will (1950). The Age of Faith: A History of Medieval Civilization -- Christian, Islamic, and Judaic -- from Constantine to Dante: A.D. 325-1300, The Story of Civilization, volume IV. Simon and Schuster. Korotayev, Andrey (1994). Apologia for "The Sabaean Cultural-Political Area" // Bulletin of the School of Oriental and African Studies 57: 469-474. MacCulloch, Diarmaid (2009). Christianity: the First Three Thousand Years, Viking Penguin. This page was last edited on 27 January 2019, at 22:18 (UTC).